Celebrate. 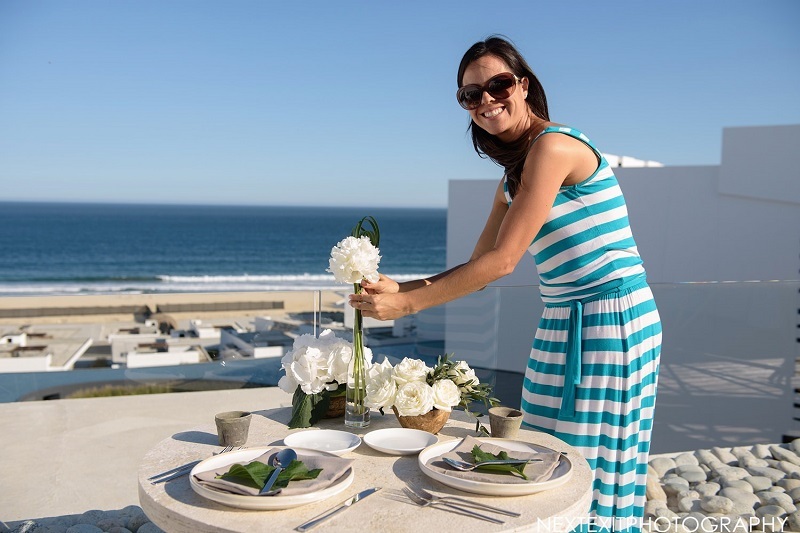 The Viceroy Los Cabos Opens Soon! 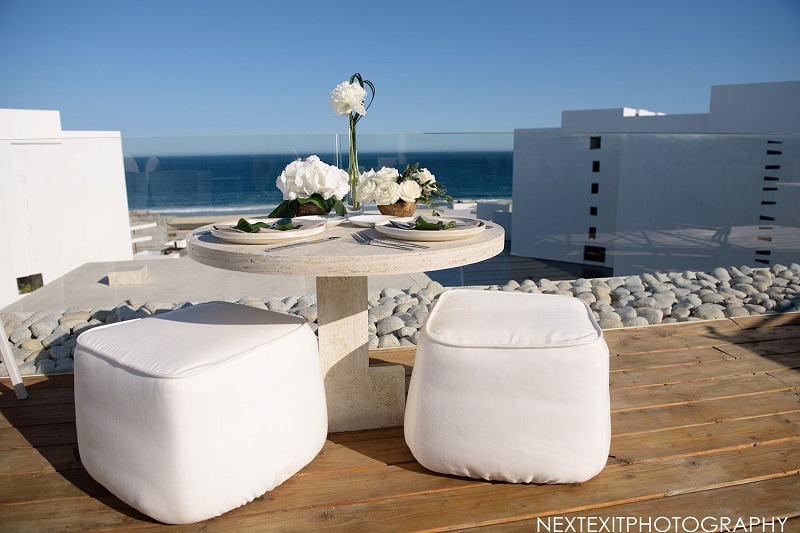 THE MODERN, MINIMALIST ARCHITECTURE of the Viceroy Los Cabos, formerly known as Mar Adentro, is one of Los Cabos’ newest luxury hotels. Now, as of this May, it will re-open as a newly re-branded property under the Viceroy Hotels umbrella. 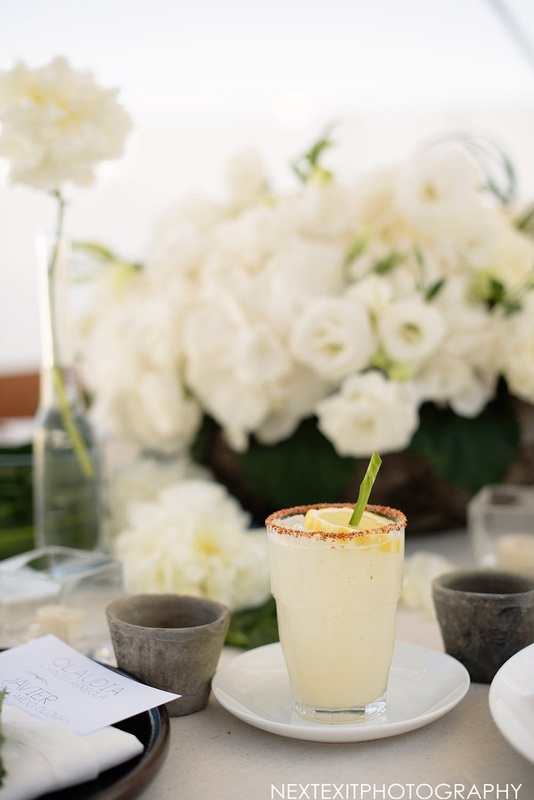 Which means, all the style, luxury, and amenities that Viceroy is known for, including four restaurant and lounges, a rooftop bar, spa, kids club, white sandy beaches, private beachfront villas, dreamy pools and water features, a world-class fitness center, movie theater and more. 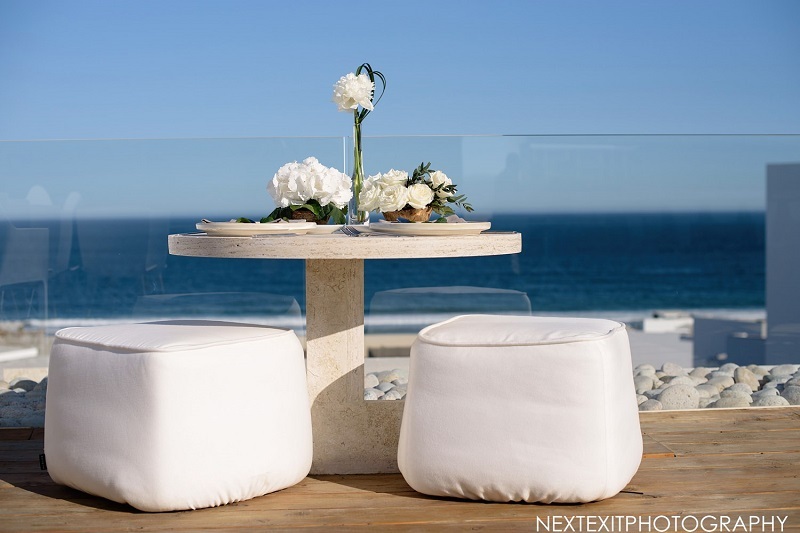 All wrapped up in an architecturally stunning hotel concept designed by one of Mexico’s most regaled architects, Miguel Angel Aragonés. 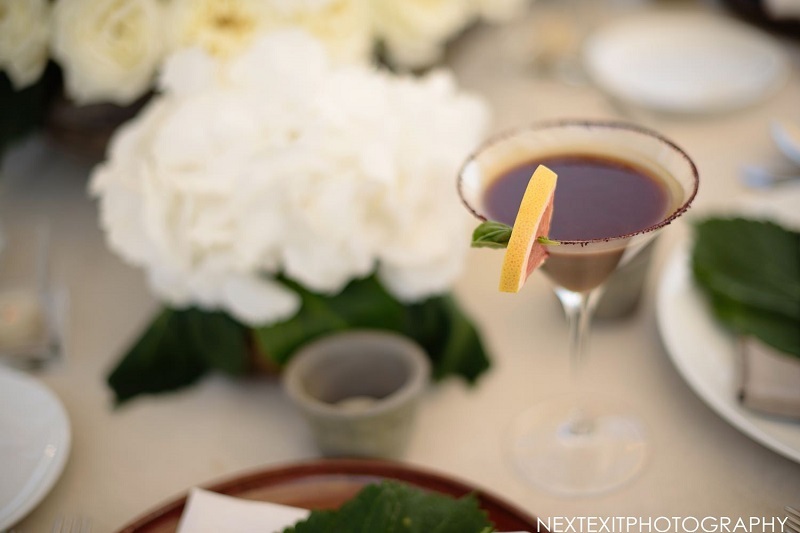 And, from that moving statement, another wedding inspiration photo shoot was born! 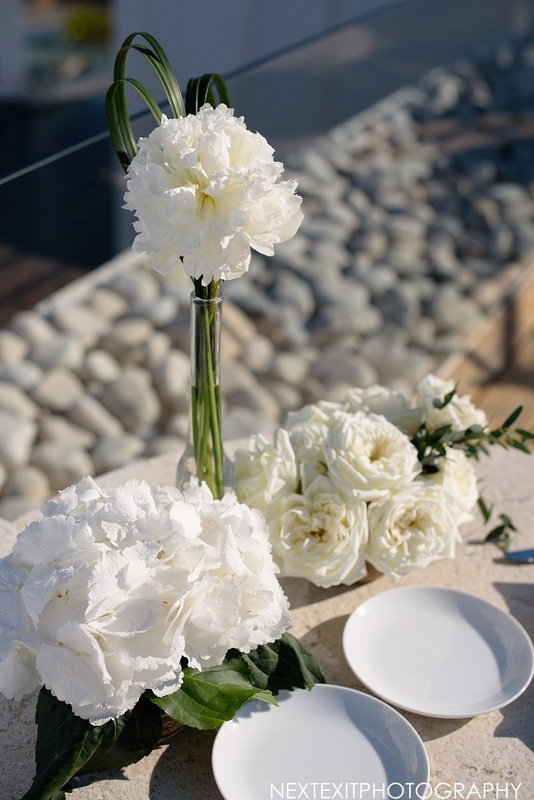 Working with the hotel’s then-management, Elena designed a monochromatic, uncomplicated tablescape in the hotel’s rooftop cafe and lounge. 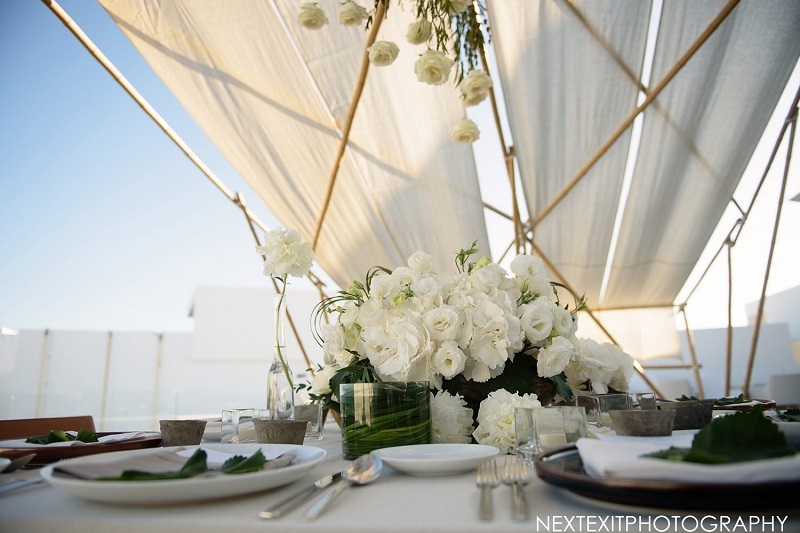 Please, dear friends, take a look at what our collaboration with Macarena Chiriboga and Bamboo Biz; and Next Exit Photography produced for a little contemporary wedding inspiration! 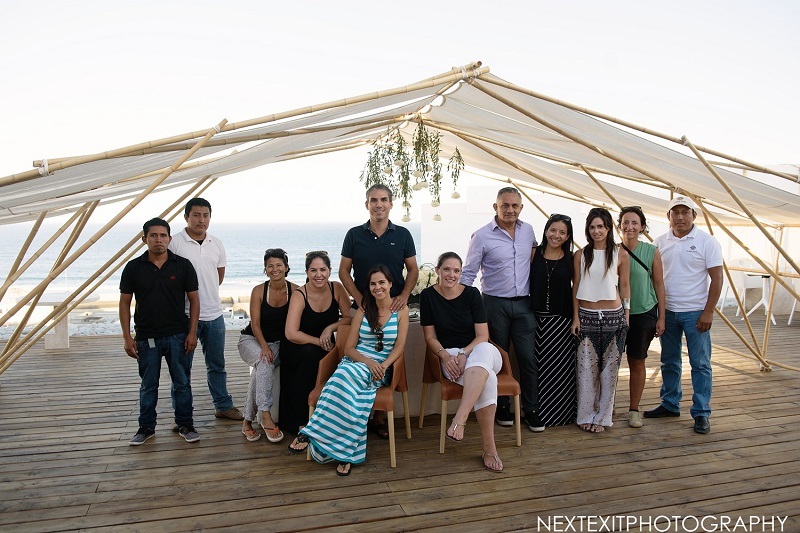 We look forward to working with the new Viceroy Los Cabos team when it opens in May 2018! 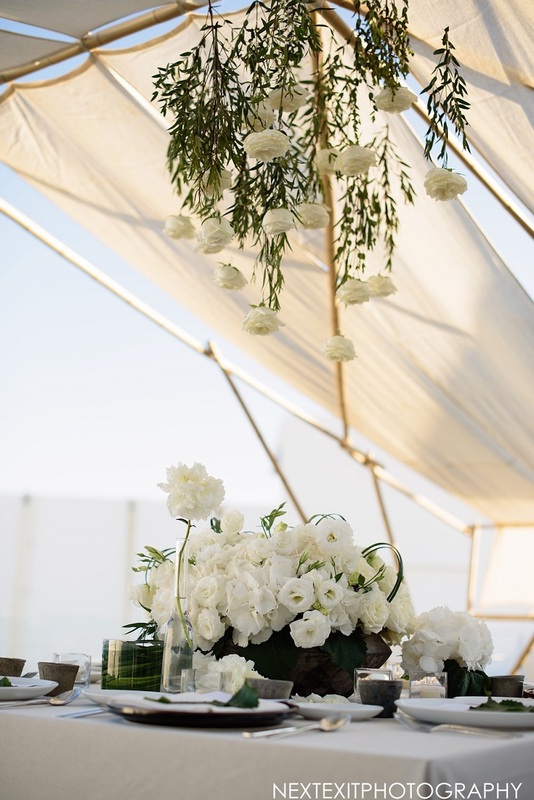 A SWEETHEART TABLE WITH AN AMAZING VIEW, Elena puts the final touches on the simple, natural floral arrangement she created using white hydrangea, peonies and garden roses. 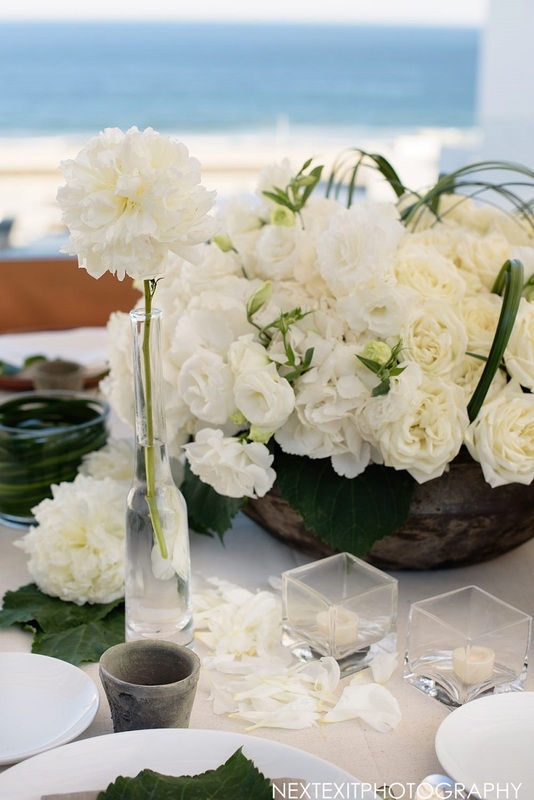 The sand-colored stone table, modern china and white ottomans all belonged to the hotel, and are designed to blend into the scenery. 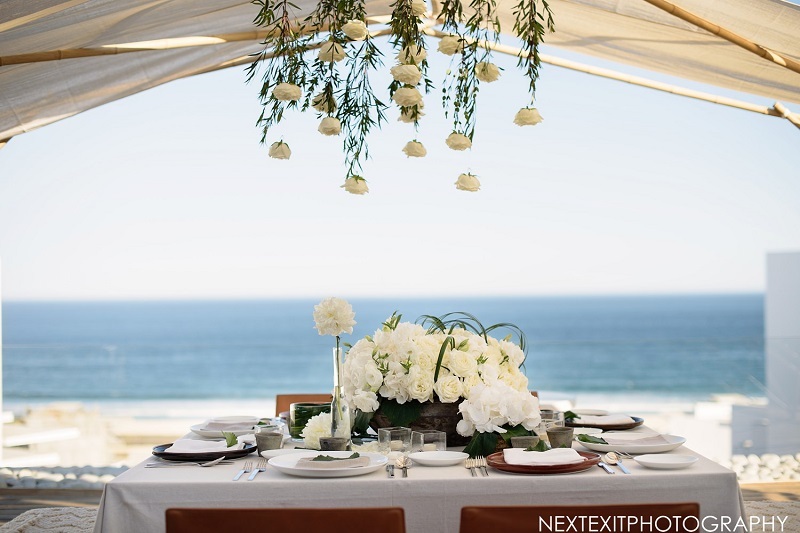 Nothing breaks or distracts from the view of the ocean and sky beyond. 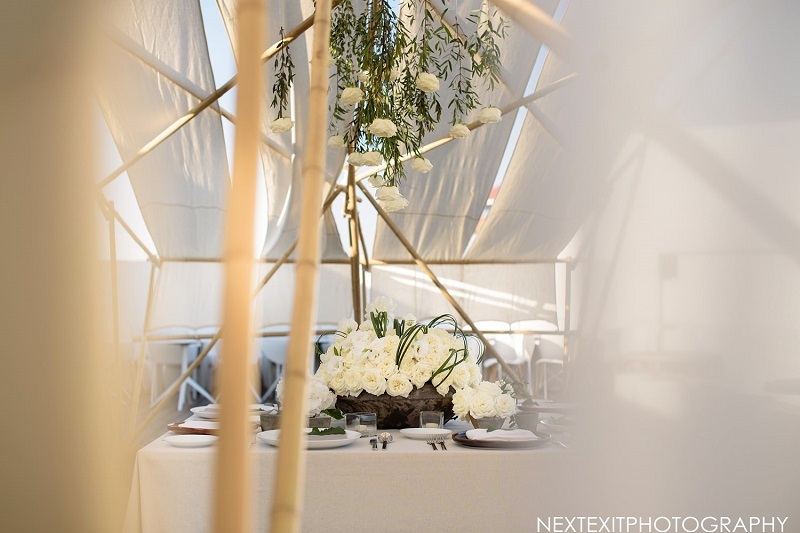 FOR THE LARGER TABLESCAPE we partnered with the talented design team at Bamboo Biz to bring a natural structure to the stark setting. 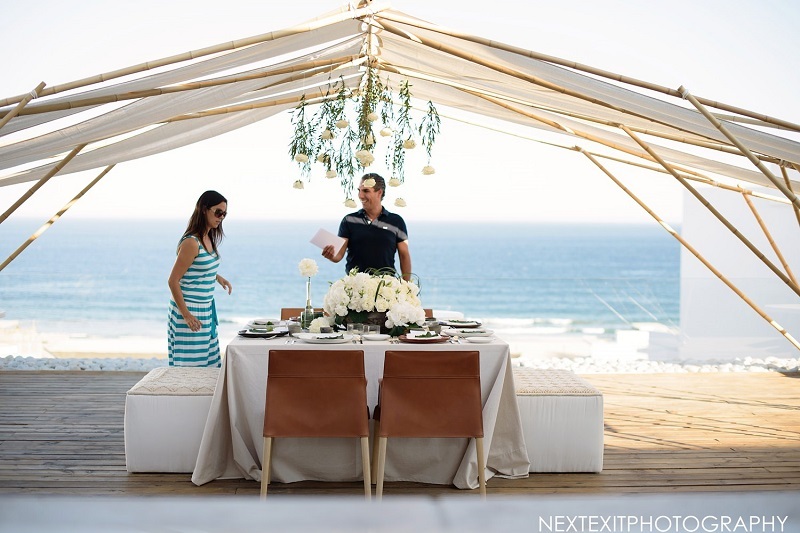 For events, a ceiling of any kind can bring shelter to the guests seated below, as well as much needed shade and wind protection to flowers and candles. 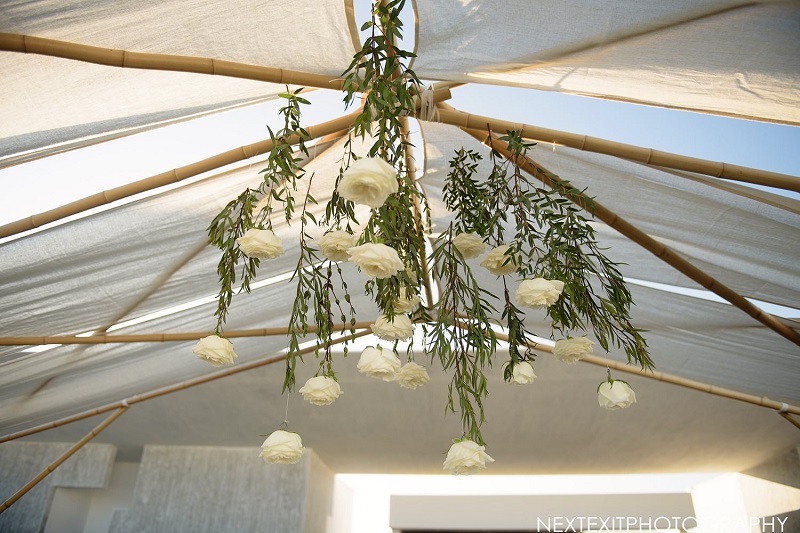 But a structure, even one as light as this modern bamboo canopy, is also ideal for lightweight botanical installations like our floating roses. 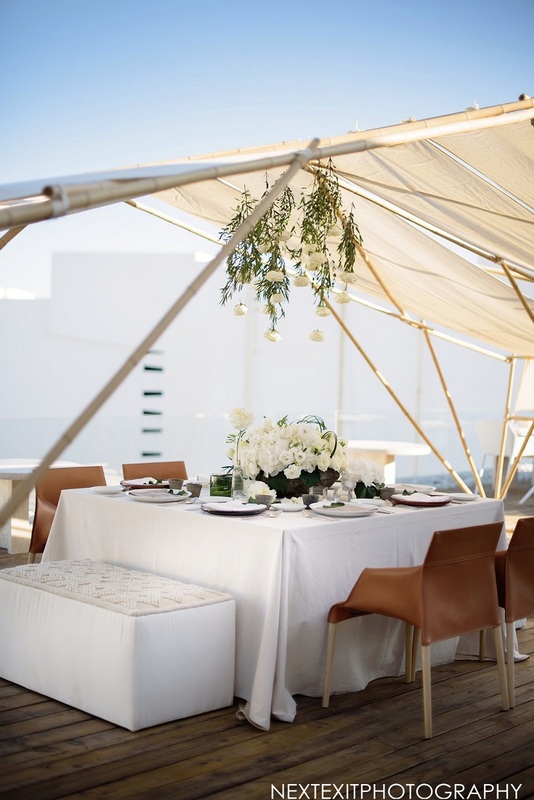 Below the canopy, we placed our square dinner table and covered it with a simple taupe linen tablecloth. 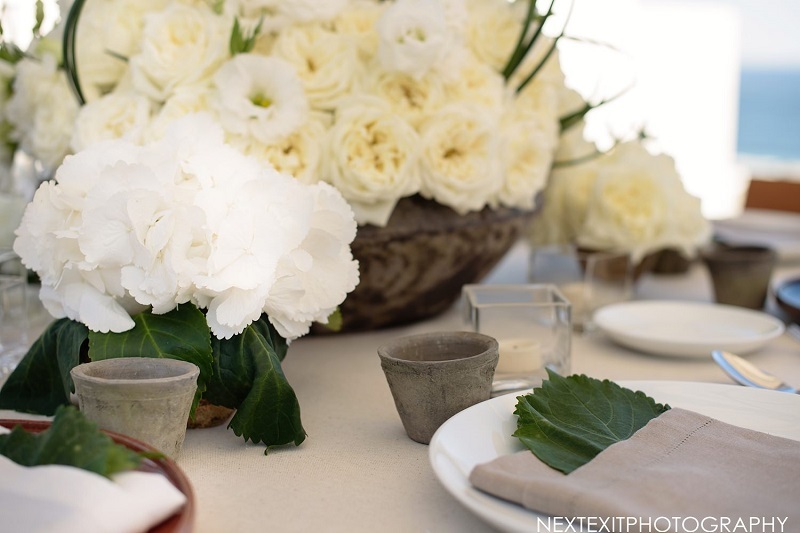 Two of our custom designed woolen benches, as well as brown leather chairs from the hotel and our lush all white floral centerpiece complete the design. 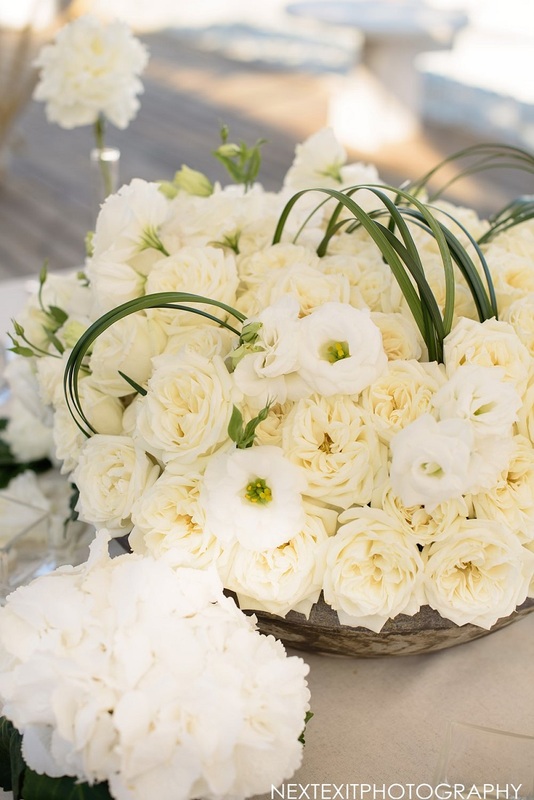 Flowers used included open garden roses, lisianthus, hydrangea, and peonies. 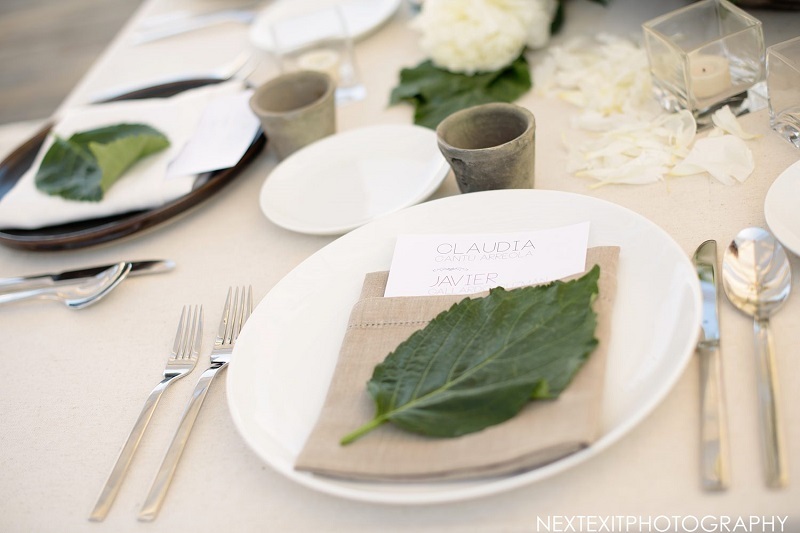 Simple place settings were the final touch on this modern organic design. 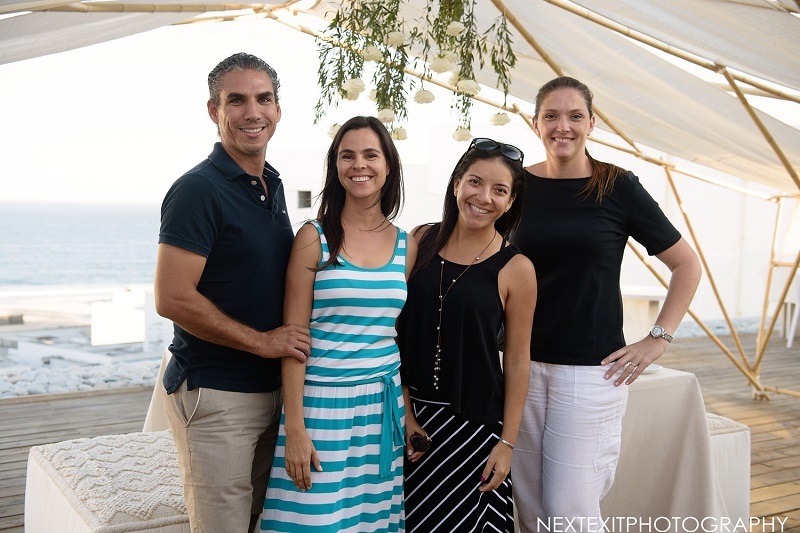 TEAMWORK AND COLLABORATION are everything. 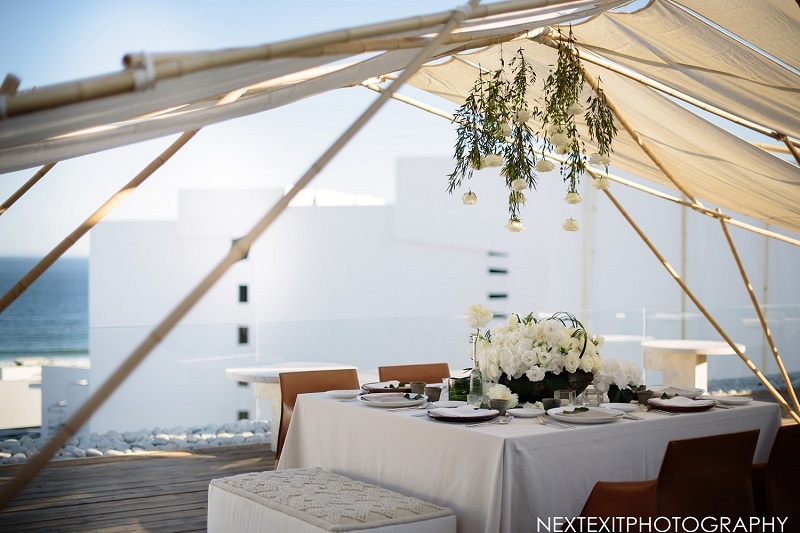 Of course, our in-house wedding planners Claudia Morales and Elsa Dilasser loved introducing our destination weddings and corporate event clients to the stunning beauty of Mar Adentro. 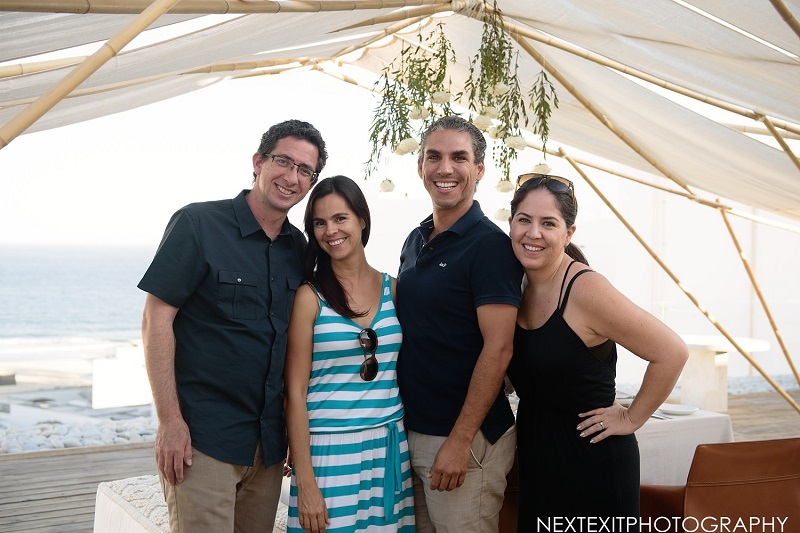 Now, we look forward to re-introducing them to the newly renovated and rebranded Viceroy Los Cabos! 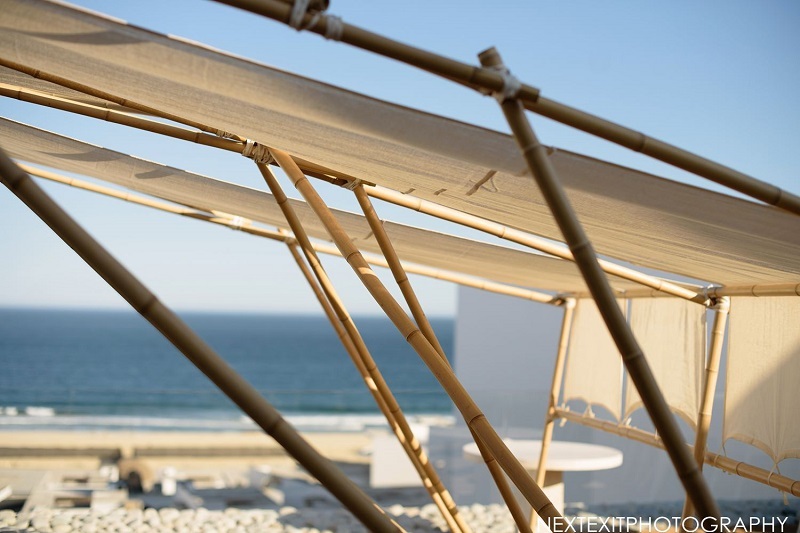 We thank the teams from the hotel, Bamboo Biz and Next Exit Photography for their vision, flexibility an cooperation. 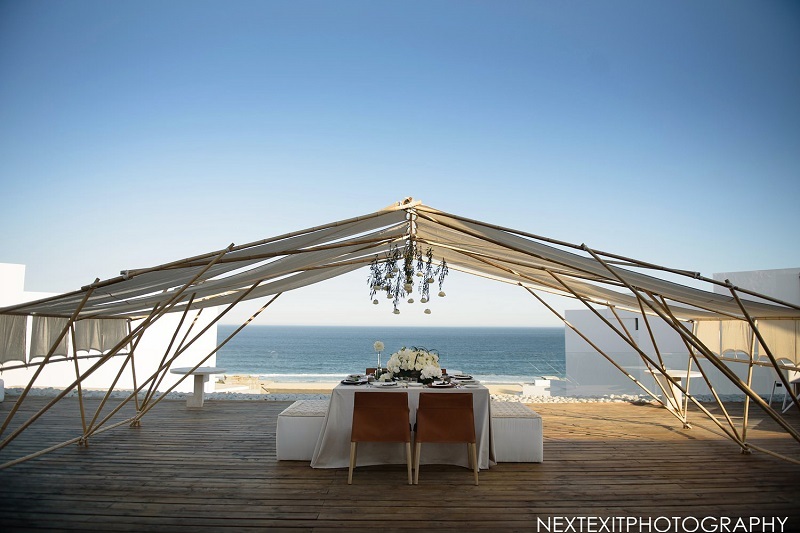 Another incredible design to inspire your own dream Cabo San Lucas wedding! 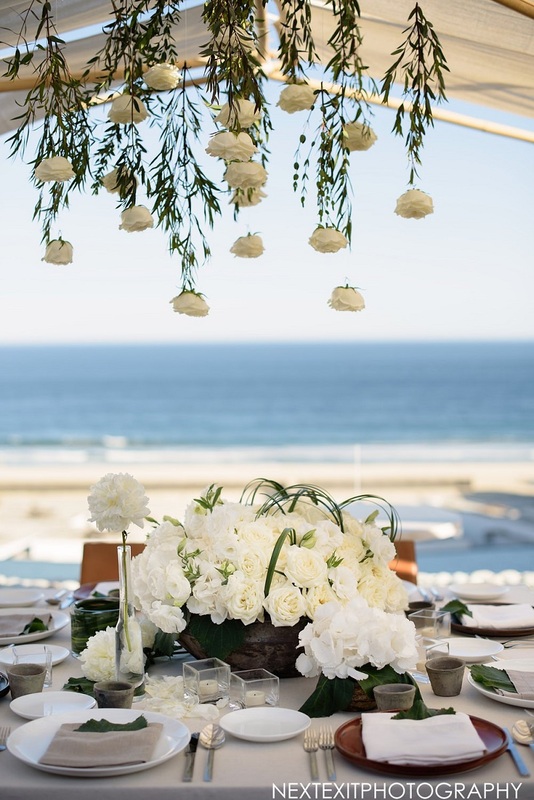 I have a few questions regarding my future wedding at Mar A Dentro and I wanted to see if you also know or have any flower shops would be interested in decorating our wedding next year. Please shoot me an email and would like to find out more about your work and other options. Hi Leni, thank you for your email. 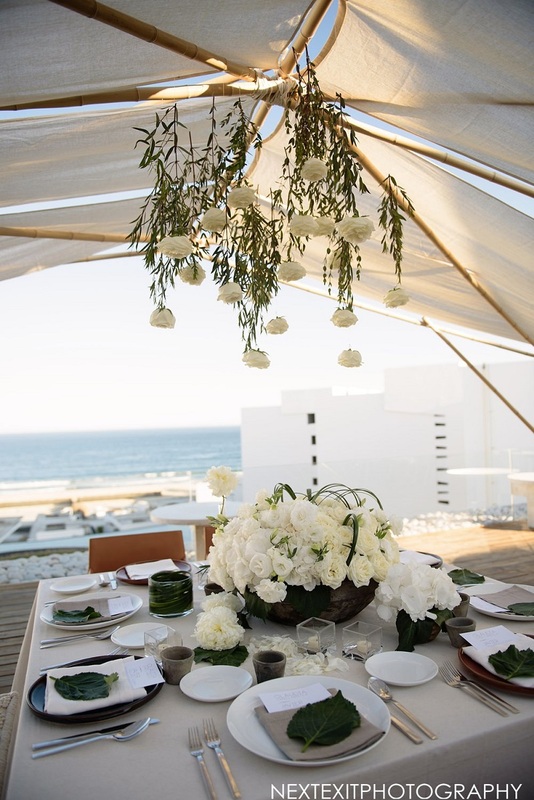 If you haven’t already spoken with Carlos or Elena Damy directly, please know they will get back to you shortly to discuss their services (wedding planners and floral/event design), and how they can specifically assist you with your wedding at Mar Adentro (Viceroy Los Cabos). 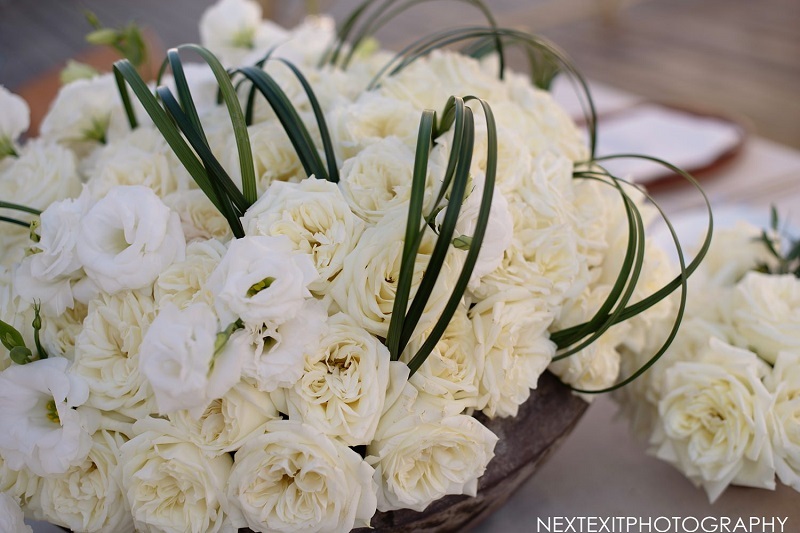 Thank you for reaching out here, and congratulations on your upcoming wedding!